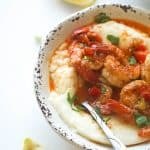 Cajun Shrimp and Grits- Creamy Grits with Cajun Shrimp , a Southern Classic Elevated! With Bold and Spicy Seasonings . Guaranteed to Please! The holidays are coming – days and weeks of exhaustion from cooking, cleaning and parties you need to go to and prepare for. It really never ends does it? I know for most people December is the Joyous month of the year – AND the one that makes you Super Anxious too! There’s always something that pops up, one more thing yet to be crossed off from the ever-revolving list. When it’s just too much to handle then it’s time to whip this Southern Comfort Meal. Cause there is NOTHING as comforting. Trust me! It will make your blues go away. Well, maybe for just a little while. When I make this Cajun shrimp and Grits I have it for Breakfast and Lunch. No Dinner for me! Cause am stuffed!!!! At 6 pm am already in my pajamas, watching a Suspense Movie. Never mind the dishes, the list, and the anxieties – they can wait tomorrow! This creamy homemade Shrimp Cheesy Grits is at the top of my comfort food list. It’s just So Satisfying. 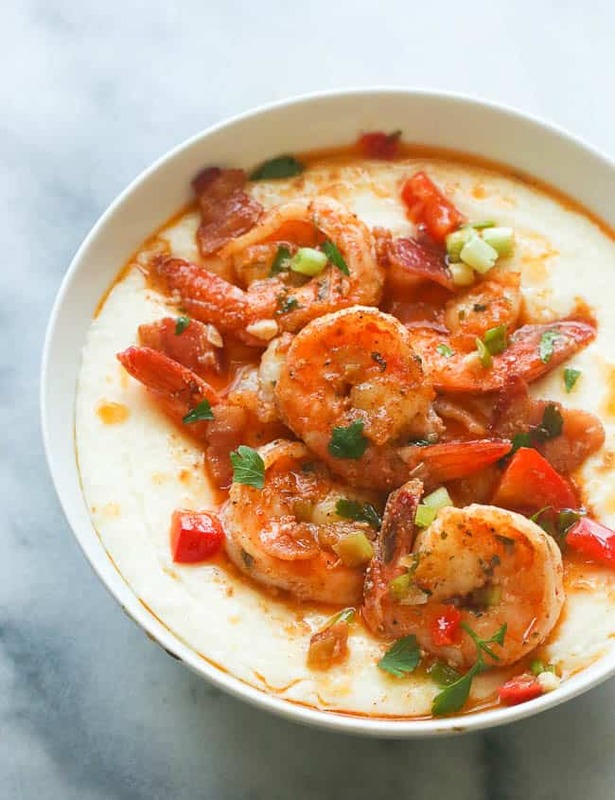 Adding aged white cheddar just makes it even more comforting and amps up this classic Shrimp Grits recipe. And what’s not to love about bacon? HELLO!!! Bacon makes everything taste better, just in case you didn’t know that. 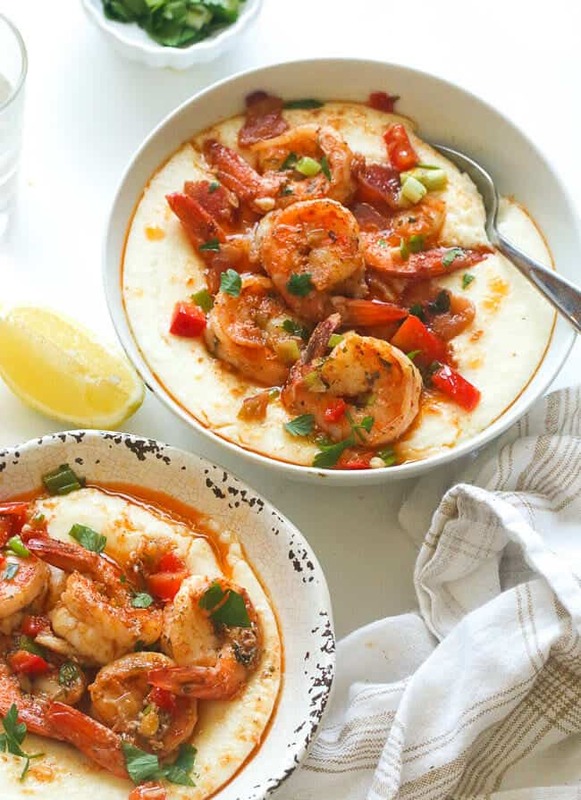 The best part of this Bacon & Shrimp Cheesy Grits is that all the ingredients are readily available in your pantry or refrigerator. Some people like to use stone ground grits. I do too! But to tell you the truth it’s hard to come by. So don’t go running around try to get it, like I did once. Your best bet would be Amazon or just sub with 5 minutes grits and it makes the cooking time even Short and Sweet. Don’t be put off by the grits. There isn’t that much stirring required. Anyone can make this this. And this would be great for Valentine’s Day or a date Night. Add about 2 Tablespoons of cream cheese for extra creaminess. Meanwhile in a large skillet over medium heat, sauté bacon until brown and crisp this may take about 3-5 minutes. 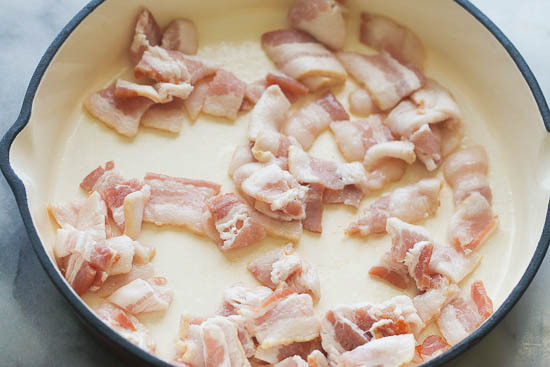 Remove bacon form skillet and transfer to a plate. 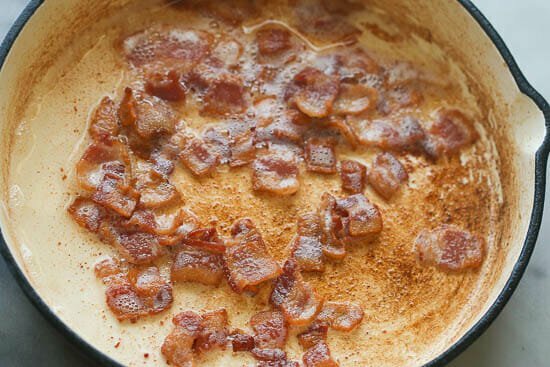 There will be some bacon drippings left in the pan (about 3 tablespoons). Then add garlic, paprika, bell pepper, parsley, and green onions. Add about 1/4 cup broth or more -adjust to preference . Continue cooking for another 3 minutes. 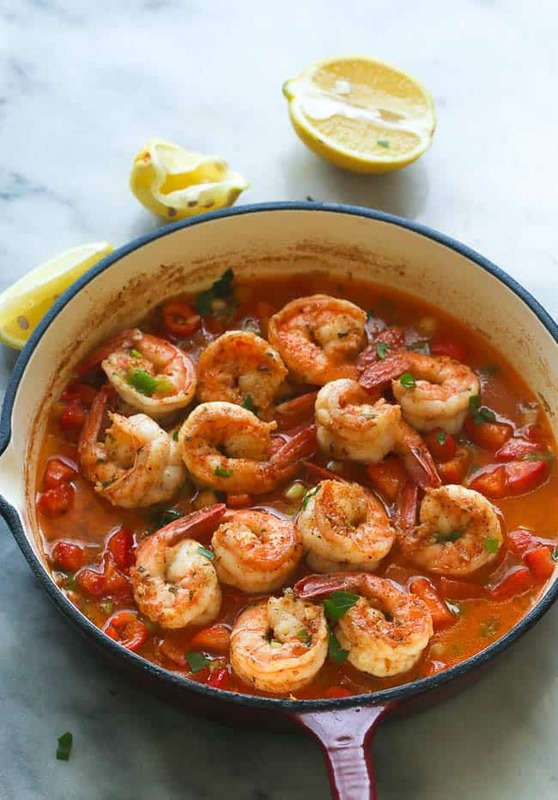 Add shrimp towards the last minute, together with lemon juice if desired , adjust to taste, throw in the crisp bacon . Adjust seasonings with salt and pepper. Start by adding water, milk, bay leaf and salt to a heavy sauce- pan. Bring to a boil. 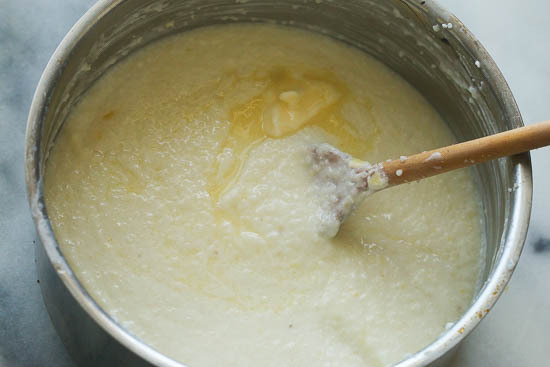 Gradually whisk in the grits, until you have added the whole thing in the pot, a little at a time. Keep stirring with a whisk to prevent any lumps. You may have to remove sauce- pan from heat while trying to get rid of lumps – if needed. 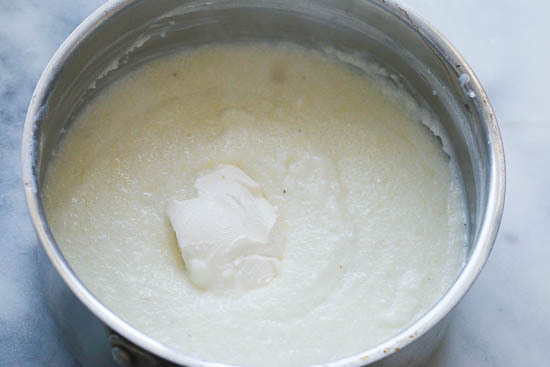 Reduce heat and cook grits at a bare simmer, covered, stirring frequently, until water is fully absorbed and grits thickened. This will take you about 15 minutes. 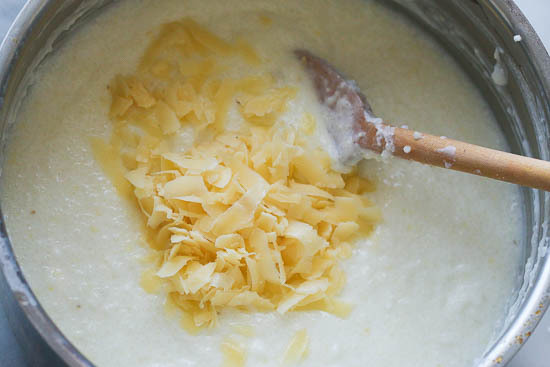 Remove grits from heat; add butter and cheese, stirring with a whisk until cheese melts. Assemble the dish by placing the grits at the bottom of a shallow bowl, Cajun shrimp and it’s sauce. Enjoy piping hot! 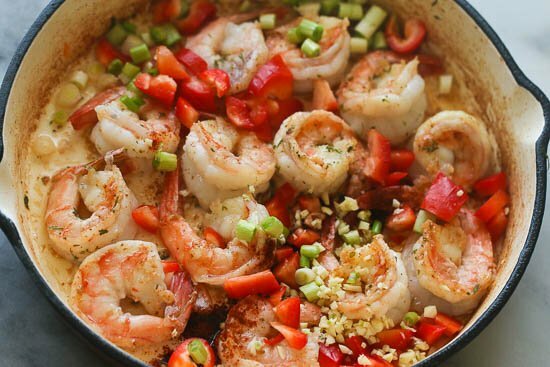 It’s best to remove shrimp before adding all the other ingredients at this point. 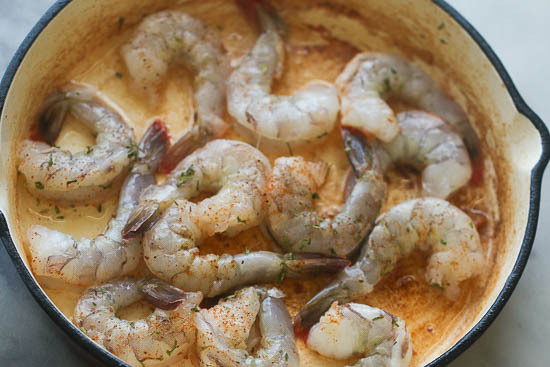 You do not want to over-cook the shrimp. Then add garlic, paprika, bell pepper, parsley, and green onions. Add about 1/4 cup broth or more -adjust to preference . Continue cooking for another 5 minutes. Adjust seasonings with , lemon juice ,salt and pepper. 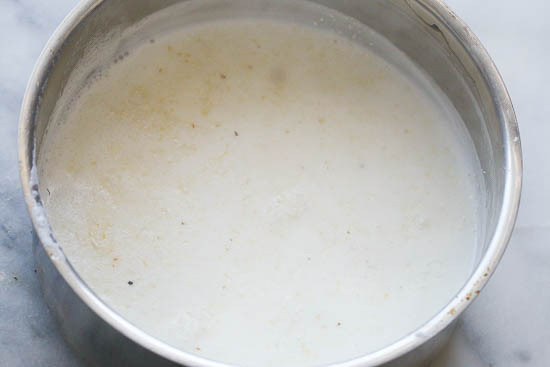 Bring to a boil and reduce heat and cook grits at a bare simmer, covered, stirring frequently, until water is fully absorbed and grits thickened. This will take you about 15 or more minutes. Plate immediately. Assemble the dish by placing the grits at the bottom of a shallow bowl, Cajun shrimp and it’s sauce. Enjoy piping hot! My husband said this was “restaurant quality”! Excellent dish and easy directions. Thank you! Great recipe! I substituted 2 chorizo sausages for the bacon. Steamed the chorizo and used the liquid in place of the water. Also added 2 jalapeños. Used 8 oz of heavy cream for the grits. Delicious. Thank you for sharing those, Bill. Glad you like it. Happy New Year! Thank you! Awesome page and the step-by-step pictures help a lot. Stone ground grits would take more time to cook(about 40 minutes ) And you might have to add more liquid as it cooks . Made this recipe, and it is DELICIOUS!! Got compliments, and had several people ask for the recipe. This is my first time finding your website, and I am excited to make this again along with more recipes from your website. Welcome on board Mary! Happy to have you hear. Can’t wait to see which other recipes you try out next. I’m going cook your recipe for Christmas breakfast. I’m doing a trial run today. It look delicious. Thank you for trying it out, Sherrie. Happy holidays! What kind of broth and what kind of cheese???? I’m hoping that you’ll read this in time as I’ve been invited to a potluck brunch in a few days and am thinking of making this dish. My only concern is that the potluck is about a hour’s drive away and I would need to transport this already made. Do you think I could plate this in a casserole dish and reheat it in the oven upon arrival? Or do you have another suggestion? Thank you for sharing the recipe! Yes you could. I would transport both the grits and shrimp separately. Then reheat separately. As the grit sits it thickens, so you might have to stir in a bit more liquid, a little at a time ,to desired consistency , use your best judgement . After reheating both the shrimp and grits you may go ahead and plate. Oh my goodness! This is the best Shrimp and Grits I have ever had!! My husband has asked for it regularly since I discovered this recipe. We make extra grits and sauce and have it for breakfast the next day. It almost doesn’t need the shrimp! My son like the shrimp part, but not the grits, simply because he doesn’t like the texture of the grits. More for the rest of us! Yaaay!I’m so happy your family loved it, Aimee! Thank you for letting me know. Yum. I was cooking for a pescatarian tonight, so I left out the bacon and sauteed the shrimp in peanut oil to give it some extra flavor. I substituted white wine for the chicken stock. The recipe was a big success. The only other flavor change I’d make is next time, I think I’ll omit the bay leaf. I love bay leaves in rice but in the grits it gave a strange flavor that didn’t quite work for us. However, all the food was consumed with enthusiasm! Making this tonight for a birthday party, so I hope you get this email soon. Two questions. If I’m using 5-minute grits do I still use the same amount of liquids? ( the canister says 4 cups of liquids for one cup grits ). And tho I’m sure it’s not exactly the same, can i use store bought cajun seasoning in place of the cajun salt? I have a McCormick blend. I would use 3 1/2 cups . Add a little more for desired amount of thickness. Yes, store-bought cajun seasoning works as well. Hi there! I’ve made this a couple of times and it has been fantastic! We are planning a surprise party for my mother – in – law’s 87th birthday party and my husband requested for me to prepare the shrimp as one of the dishes to serve. I am planning on getting about 5lbs of shrimp. Should I double up on the ingredients? What would you recommend? 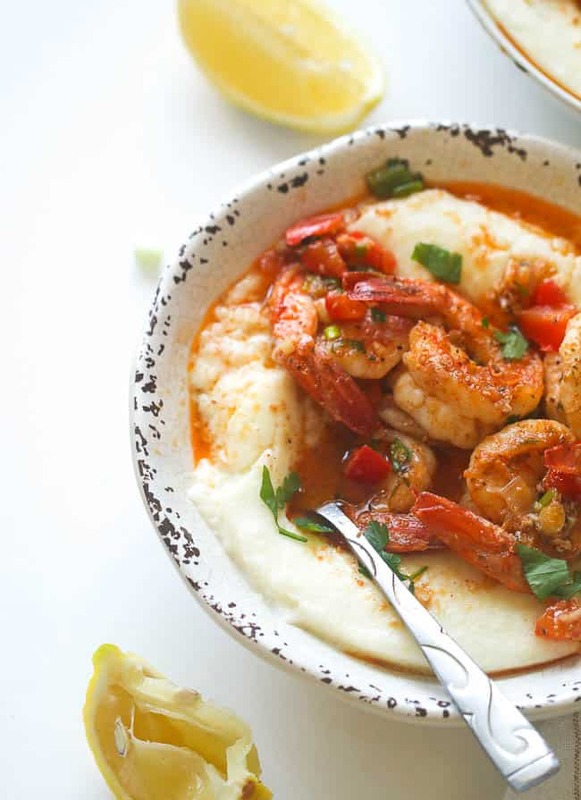 The recipe shows serving the shrimp over the grits. Can this be mixed all together to take to a potluck meal? THE FIRST TIME I EVER HAD SHRIMP AND GRITS AN FROM MY OWN KITCHEN THANKS…. YES I WELL BE PREPARING THIS AGAIN,AGAIN &AGAIN…. Yaaay! Glad you love it as much as I do, Ms. Trina. Thank you for the time. OMG thank you so much for this recipe. My son is a very picky eater and I am trying different dishes to see if he liked it. He absolutely loved it he had second lol. I took leftovers to work with me and my co-worker was taking her bread and cleaning the sauce of the plate lol I shared the recipe with her. My son took a picture and shared with friends saying his my mom should have been a chef all credit goes to you. Thanks again. Question – is that 2 cups of water and 3 cups milk? Confused by the 3 cups milk sub with water. Making tonight for my wife’s 100 year old grandmother from NOLA! Yes it is – 5 cups in total. I wish I get to live that old. Greetings to her from me . Hope she enjoys it as much as we do. Happy Cooking!!! I used chicken broth. Seafood or shrimp broth works best. Thanks! I made this for brunch at home. My husband and I completely enjoyed it!!!! We were comatose:) and loved every minute of it. Thanks for sharing! I’m so happy you both love this, Nik. It’s a perfect comfort food especially this colder months. I really like this recipe. The flavors are on point, the ingredients are accessible, and the follow through is pretty easy. I used a bag of frozen deveined shrimp. I made it for a holiday lunch and my extended family loved it. It kinda makes me feel like a bonafide southerner. Will definitely make this again. Thank you so much Bina! I really appreciate your kind words and I’m so happy you liked the Cajun Shrimp and grits . I agree – it’s so southern and a classic too 🙂 Thanks again and Happy New Year! Made this Christmas Breakfast and it was a hit with all of my family and friends. My kids loved it so much they want it for breakfast again this morning. Thanks for an awesome recipe! YESS!!! Once you make it you are hooked ! So glad to hear it was a hit with your family and friends. lol, that happens to me all the time .Thanks for taking the time to share this with me. Have a great weekend. Can you use half & half in place of milk? Hello, this looks delicious except for the fact that I’m allergic to shrimp. How would I substitute chicken instead? I’m new to Creole cooking. Thank you. You would cut the chicken in bite size pieces , then cook as instructed – extending the cooking time about 10 minutes or until chicken is fully cooked . I made this today and it was EXCELLENT! Can’t wait for dinner so I can eat some more. 🙂 Thank you for posting! Oh WOW! Thanks for feedback Chris. So happy to hear this!!! I’m a new cook. When you say 3 cups milk sub water does that mean instead of 2 cups of water? It means if you do not have milk you can replace it with 3 cups water. So 5 cups of water total. How much lemon juice did you use? The ingredients just say ( 1 lemon juice). I”m about to be 51 years old on 11/25 and I never ate grits before…Just cream of wheat…LOL!! Your presentation of this dish looks delicious, I went grocery shopping yesterday and for our “Cook Together Fridays” my husband and I do every week, we will be making this. I can’t wait, anything with shrimp in it, I love!! A Grits Virgin? Oh Boy! You are going to be head over heels with this! Perfect recipe to start with. I have made some changes to the recipe to make it even more clearer. Lemon juice is optional adjust to your taste buds. Oh, I want to know how works out for you. Wishing you the Very best on your Birthday!!! I want to make the shrimp and grits for a baby shower. 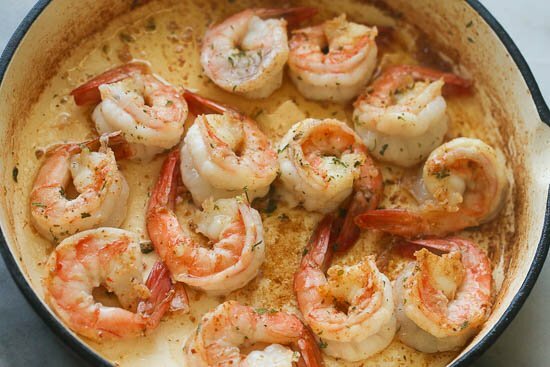 How do I keep grits creamy and shrimp not over cooked throughout the warming / sitting time? If you cook the shrimp for 5 minutes it would be just fine. Hold in a crockpot and turn to the warm setting.Grits thicken as they sit -so stir the grits occasionally and add about a tablespoon of water at a time if they become too thick. By far the BEST recipe for shrimp and grits!! And I have tried many! Just a little heat in the background made this an over the top dish! Sooo Flavorful! I made it for dinner but I already has two helpings! WOW! I am going to check out what else you have on your board! OH MY! Thank you so much!!! Really appreciate you taking the time to share this glowing review with me. This was amazing! I made it for my boyfriend and he raved about it, too! The grits were so creamy and delicious and the shrimp added just the right amount of kick. (I didn’t make the cajun salt, I just used Tony Cachere’s) We had leftovers the next day, and it was just as good the second time – and we fried some leftover grits for breakfast, too! Thank you for sharing this – it will definitely be one I make again and again! YESS! Thank you so much for the glowing feedback Janice . I SOOO frying my leftover grits next time. Can’t wait. Can you please tell me, what is cajun salt? Thanks! It’s a blend of spices . Check out this recipe here https://www.africanbites.com/creole-seasoning/. thanks for tips on preparing these tasty meals but i do not see where the bacon was added. can you please say when you add the bacon? So the bacon is just for seasoning? No ,you use the bacon fat to flavor the shrimp too. You can add the bacon during the cooking process . It’s optional! I like mine crispy . Hi Al! It means you can either use 3 cups milk or water. Happy Cooking!!! Oh Boy! That’s HUGE coming from you Louisiana Lady. Hope you are having a blast in Texas. THANK YOU SO MUCH!!! 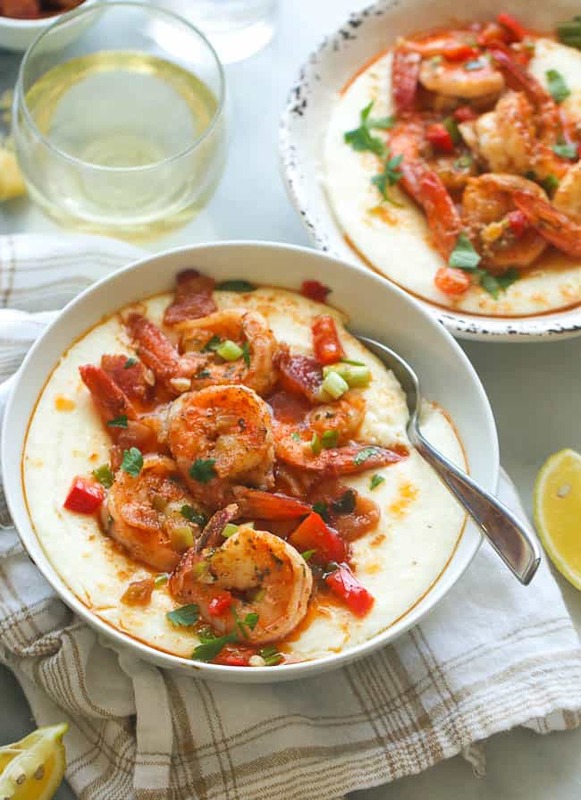 Absolutely the best shrimp and grits recipe online. Thank you for this scrumptious dish. It was delicious! Woo hoo!!! So fantastic to hear Vee Woo, thanks for letting me know! Broth isn’t listed in ingredients. Thanks for letting me know Cindy. It’s included in the instructions, will update recipe to make it clearer. Hey Imma what type of broth does the recipe call for? Hi Whitney! I used chicken broth . Once the milk is boiled but before the grits are added, are we to remove the bay leaf or does it stay in frombeginnjng to end? 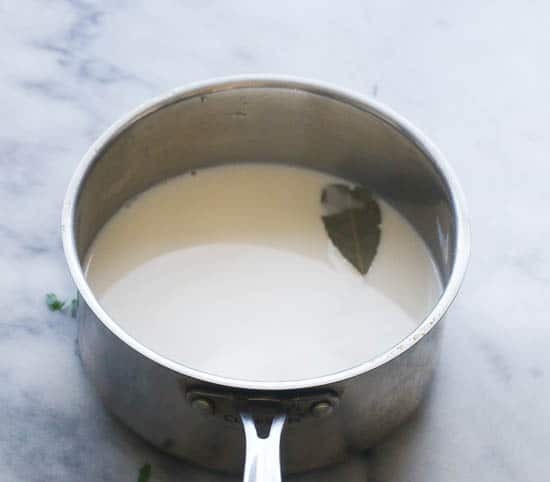 Yes, you are suppose to remove the bay leaf , after the milk is boiled. Great meal everone enjoy it and so did i,happy new year thanks. Made this for my class graduation and they were in awh!!! You are absolutely a god send thank you for sharing!! You are my go-to website for African diaspora cuisine. And a very sweet and pretty woman to boot! Aww thank you so much Didina! You are SO Sweet ! Your are the BEST!!!! Made this for dinner tonight. Everything was absolutely fabulous, and those grits were to die for! I can see the grits making many appearances with all sorts of toppings. Thank you so much for posting. Awesome! Thank you so much for taking the time to let me know . I appreciate you!!! 3 times? YESS! Thank you so much ! What broth or stock do you use?